This continues our weekly roundups of the Fall and Winter Leagues, highlighting performances from players in the Red Sox organization. Coverage will continue every Monday into January. For the full list of Red Sox prospects participating in these leagues, check out our Fall & Winter Leagues page, which will be updated continuously through January. This week's roundup covers the period of November 19 - November 25. Recently signed right-hander Domingo Tapia has been a staple in the Gigantes bullpen so far this fall, a trend that continued this week. Tapia made three scoreless appearances, allowing three hits. The longtime Mets farmhand has yet to allow a run in 13 appearances, holding opposing batters to a .233 batting average. Jhon Nunez was the only other player who saw action this week int he Dominican, going 3 for 9 with a walk, stolen base, and pair of runs scored. Both of Boston's charges in Mayaguez saw action this week. Veteran shortstop Jeremy Rivera was 1 for 6 with a walk in his two games. Juan Centeno appeared in three games, going 1 for 8 with a run driven in. Only two of the assigned players saw game action this week and, for both, it was a limited engagement. Deiner Lopez appeared in two games, going 1 for 6 and collecting a pair of RBI. Pitcher Enmanuel De Jesus was the only other affiliated player to see playing time, facing just two batters on Saturday. He walked one of the two, with that runner coming around to score after De Jesus had departed. Jake Romanski has gotten significant action for the Melbourne Aces. The catcher played four games this week, going 4 for 15 with a walk and an RBI. Romanski is hitting .310 (10 for 29) through eight games in total. Harrison Cooney was roughed up in his only outing. He took the loss on Sunday for Melbourne, surrendering a three-run homer. In 1 1/3 innings, he gave up three hits, walked one, struck out two, and hit a batter. Pedro Castellanos and Victor Acosta (pictured) continue to be standouts in the Liga Paralela, leading the Boston squad to a 4-1 week. Castellanos was 7 for 13 (.538), including a decisive three-run homer in the first game of Wednesday's doubleheader. Overall, he drove in six runs, scored five, homered twice, doubled, and walked twice, and he has a robust .456/.544/.842 line this fall. Acosta blasted three homers on his way to a 7-for-14 week. He also doubled twice, scored eight runs, drove in eight more, and led the way in Thursday's 13-0 rout. 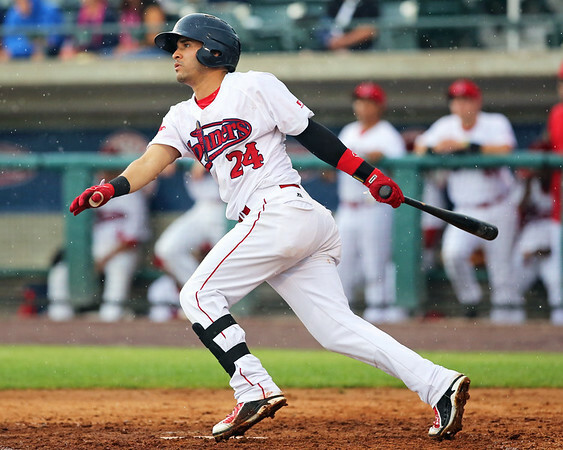 Carlos Tovar also played a big role in the Thursday drubbing of the Phillies affiliate, ripping three doubles. He was 6 for 17 on the week. Lewis Baez, who has not homered in 170 plate appearances over the last two regular seasons, went deep on Thursday. Jesus Marrero picked up a pair of doubles during a 4-for-14 week. Keibert Petit gave opponents fits, reaching base nine times in 13 plate appearances. On the mound, the story continues to be the unexpected appearance and performance of former bonus baby Christopher Acosta. Signed for $1.5 million back in 2014, Acosta appeared in nine games in the DSL in 2015 but has been suspended since. Apparently taking steps to get his career back on track, the Dominican right-hander turned in another strong performance on Friday, allowing just an unearned run on three hits in five innings, striking out eight of the 17 batters he faced without issuing a walk. He now has a 2.25 ERA and 19 strikeouts in 20 innings. Jesus Rossillo also had a standout performance in his start, striking out seven in three hitless innings. The only blemish for Yoelvis Guedez was a solo home run, as he struck out five without walking a batter in three innings of relief. Luis Rivero tossed 2 2/3 scoreless innings across two relief outings, striking out five and surrendering just one hit without issuing a walk.